November 2011 - EcoZone Grand Opening! September 2011 - Bear Bones in the EcoZone? Lehman Township, Dingmans Ferry, PA - The transformation is nearly complete! The old indoor pool at the Pocono Environmental Education Center has become the new EcoZone! exploration & discovery room. The EcoZone! will be open to the public for the first time November 20, 2011 from 12:00 to 3:00pm. Everyone is welcome to visit & explore during the grand opening. Visitors will enter the EcoZone! next to a life-sized Bald Eagle’s nest & a giant eagle mural by Ken Batelman. The mural was supported in part by the Pennsylvania Council on the Arts, a state agency funded by the Commonwealth of Pennsylvania and the National Endowment for the Arts, a federal agency. The eagle’s nest will show visitors what an actual eagle nest looks like and students will be able to climb into the nest to experience the world of the eaglets (baby eagles) after they hatch. Another prominent exhibit is the bat cave. Visitors to the bat cave will crawl through the serpentine tunnel and enter the “decorated” big room. The big room is decorated with stalactites, stalagmites, flowstone, and rimstone. Visitors can explore the cave exhibit and learn about cave ecology and troglobites (cave dwelling animals). The black bear skeleton display is a “puzzle”. Kids and adults will be able to see and understand the difference between bear & human skeletons as they manipulate the 75 magnetized bones to complete the skeleton of what was a 450 pound bear. Visitors will be able to examine the large teeth and claws, but the relatively small skull and students will be able to see how the shape of the skeleton helps bears to adapt & survive in their environment. Other exhibits include a beaver lodge, an aquaponics display, a fossil pit, a recycling display, a watershed display, “The Lab”, a “Skins & Skulls” display, and the “Critter Corner”. Lehman Township, Dingmans Ferry, PA - Stalactites, stalagmites, flowstone, and rimstone?? These are all features of the Pocono Environmental Education Center’s (PEEC’s) new bat cave. The bat cave is only one of the exhibits at the soon-to-open EcoZone! – a hands-on discovery room where visitors can experience & learn about the natural world. Visitors to the bat cave will crawl through the serpentine tunnel and enter the “decorated” big room. The big room is decorated with stalactites, stalagmites, flowstone, and rimstone. Visitors can explore the cave exhibit and learn about cave ecology and troglobites (cave dwelling animals). The EcoZone, with its varied display exhibits, will officially open Sunday, November 20, 2011. Everyone is welcome to explore the EcoZone from 12 to 3pm. PEEC’s mission is to advance environmental education, sustainable living, and appreciation for nature through hands-on experience in a national park. PEEC provides unique, year-round environmental experiences to families, school groups, scouts, and nature enthusiasts of all ages. The environmental center is located near mile marker 8 along Route 209, within the Delaware Water Gap National Recreation Area, in Dingmans Ferry, PA (Lehman Township). For more information call (570) 828-2319 or visit PEEC on the web at www.peec.org. PEEC is close to home, where learning comes naturally! 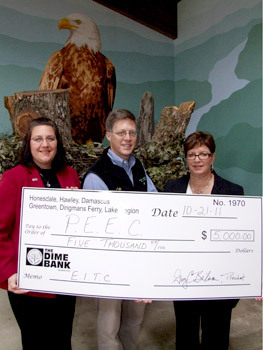 Lehman Township, Dingmans Ferry, PA - The Pocono Environmental Education Center (PEEC) would like to thank The Dime Bank for its generous donation through the Pennsylvania Education Improvement Tax Credit program. The $5,000 donation will be used for the “Take a PEEC at Environmental Education” programs, which will help local students from schools in Pike & Monroe County make the connection between the classroom & nature. Through this donation, students from the East Stroudsburg Area School District & the Delaware Valley School Districts will be able to visit PEEC for environmental education field trips. A new Discovery Room featuring items native to the surrounding region will be opening in November. This interactive display will feature snakes, an eagle’s nest, a bat cave, a beaver lodge and a bear skeleton, to name a few of the exhibits. “Due to shrinking school budgets, generous donors like The Dime Bank give students the opportunity for educational field trips, which might not otherwise be available,” noted PEEC’s Executive Director Jeff Rosalsky. The Dime Bank is your total financial partner serving Wayne and Pike counties in Pennsylvania and Sullivan County, New York. The Bank offers a full array of financial services ranging from traditional products to electronic banking and trust and investment services. For more information on The Dime Bank, visit www.thedimebank.com. Community banking yields community benefits. Pictured left to right: The Dime Bank Dingmans Ferry Office Manager Amy Burke; PEEC Executive Director Jeff Rosalsky; The Dime Bank Vice President Commercial Loan Officer Marcia Guberman. Lehman Township, Dingmans Ferry, PA - A life-sized Bald Eagle’s nest is one of the new exhibits located in The Pocono Environmental Education Center’s (PEEC’s) soon to open EcoZone! 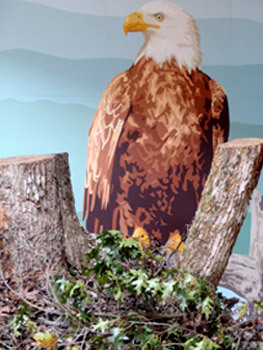 The Bald Eagle’s nest is located next to a giant eagle mural by Ken Batelman. The mural was supported in part by the Pennsylvania Council on the Arts, a state agency funded by the Commonwealth of Pennsylvania and the National Endowment for the Arts, a federal agency. The nest will show visitors what an actual eagle nest looks like. Students will even be able to climb into the nest to experience the world of the eaglets (baby eagles) after they hatch. The nests of the Bald Eagle are typically 5 feet in diameter, though some can reach 9 feet. The nests can be 12 feet deep & weigh up to 2 tons. Even though PEEC’s nest seems extremely large, it is actually very close in size to one that would be found in nature. Since most people never get to see a real Bald Eagle’s nest, PEEC added one to the EcoZone! as a component of the discovery room. The EcoZone will officially open on Sunday, November 20, 2011 and all are welcome to explore its wonders from 12 to 3pm. The beavers have completed work on the beaver lodge in the Pocono Environmental Education Center’s (PEEC’s) new EcoZone Discovery Room. Three thousand two hundred seventy three sticks were individually gnawed as raw material and 2.29 tons of pond muck were tail slapped in the creation of the lodge in the deep end of the old indoor pool. The beavers were paid at full prevailing wage in white birch trees and high bush blueberries and had full dental benefits. The EcoZone will officially open on Sunday November 20, 2011 and all are welcome to explore its wonders from 12 to 3pm. Bear Bones in the EcoZone? Lehman Township, Dingmans Ferry, PA - The bear skull is connected to the first vertebra (the Atlas). The Atlas is connected to the Axis, and the Axis is connected to the…you get the picture. In the Pocono Environmental Education Center’s (PEEC’s) new EcoZone, you will get to do the assembly. The black bear skeleton is a “puzzle” that visitors to the nearly completed EcoZone will be able to put together. Kids and adults will be able to see and understand the difference between bear & human skeletons as they manipulate the 75 magnetized bones to complete the skeleton of what was a 450 pound bear. Visitors will be able to examine the large teeth and claws, but the relatively small skull. Students will be able to see how the shape of the skeleton helps bears to adapt & survive in their environment. Please note that no bears where harmed in the creation of this exhibit; this bear died of natural causes in the wild. After staff& volunteers transferred the bear to PEEC over a year ago, the bones were cleaned by dermestid beetles, then sealed & preserved. Now, the bones are being arranged into a hands-on exhibit. You can see photos of the work in progress on PEEC’s Facebook page or visit PEEC to hike our trails and check on the EcoZone! The windows into the room have been uncovered & visitors to PEEC can observe the daily progress. The grand opening of the EcoZone is planned for late November 2011. Lehman Township, Dingmans Ferry, PA - Did you ever want to go inside a Beaver Lodge or a Bat Cave? The Pocono Environmental Education Center (PEEC) is in the process of transforming its indoor pool into an EcoZone! – a hands-on, discovery room. The new interactive exhibit room at PEEC will open this November and will include a bat cave, beaver lodge, eagle’s nest, fossil pit, and much more. The displays will be hands-on and interactive; visitors will crawl through the bat cave, walk through the beaver lodge, and dig for fossils. PEEC’s old indoor pool has been closed for some time due to the high cost of maintenance & repairs. In an effort to make use of the large space in a way that would complement PEEC’s mission, Executive Director Jeff Rosalsky visualized a room where the thousands of children that visit PEEC each year could learn about nature in a fun, hands-on setting. Through the efforts of PEEC staff & volunteers, and with many generous donations of funds, time, and materials, the room is nearing completion. You can see photos of the work in progress on PEEC’s Facebook page or visit PEEC to hike our trails and check on the EcoZone! The windows into the room have been uncovered & visitors to PEEC can observe the daily progress. Lehman Township, Dingmans Ferry, PA – As the autumn days become shorter & cooler, many birds will begin heading south for the winter. Birders of all levels, novice to experienced, can spend the weekend of September 23-25 at the Pocono Environmental Education Center (PEEC) in search of warblers, raptors, and other migrating birds. The weekend will begin on Friday evening, September 23 & continue through Sunday afternoon, September 25. Participants will enjoy day trips to Sunrise Mountain & other migration hotspots, guided bird walks, live raptor presentations, and more. To register, call PEEC at 570-828-2319. The cost of the weekend is $195, which includes 2 nights of lodging & 6 meals. Commuter & day rates are also available. Please visit www.peec.org/events-date for a complete list of all upcoming PEEC events and programs. Lehman Township, Dingmans Ferry, PA - Celebrate Autumn at the Pocono Environmental Education Center’s (PEEC’s) “Harvest Festival” on Saturday, September 10, 2011 from 10:00am to 4:00pm. This exciting new event will feature old-time activities and seasonal exhibits, including candle making, arts & crafts, and food preservation. This great event will also include interpretive hikes, hands-on learning stations, conservation exhibits, live music, local food, beverages, and a live animal presentation by the Pocono Wildlife Rehabilitation Center. Pre-registration is not required & the admission is only $5 per car, so stop by with your family and friends to enjoy a beautiful fall day. PEEC’s mission is to enhance environmental awareness, knowledge and appreciation through hands-on experience in a natural outdoor classroom. It provides unique, year-round, environmental experiences to families, school groups, scouts, and nature enthusiasts of all ages. PEEC is located near mile marker 8, within the Delaware Water Gap National Recreation Area, in Dingmans Ferry, PA (Lehman Township). For more information call (570) 828-2319 or visit PEEC on the web at www.peec.org for a complete list of all upcoming PEEC events and programs. PEEC is close to home, where learning comes naturally! Lehman Township, Dingmans Ferry, PA - The Pocono Environmental Education Center (PEEC) will host an informally formal fundraiser on Saturday, August 27 beginning at 7:00pm. The theme will be “Flip Flop Fundraiser” and the event will be hosted in PEEC’s international award-winning “green” dining hall. As a fun twist to the fundraiser, the event is informally formal; gowns, jeans, tees, and ties are all welcome, as are, of course, flip flops. Delicious finger foods & drinks, including local Shawnee Craft Beer, will be served and the event will include a silent auction. Local art & PEEC staff-led adventures will be included in the auction – canoeing, birding, low ropes course excursions, and more. The price will be $75 per person with the proceeds to benefit PEEC. Reservations made after August 15 will be $85 per person. Lehman Township, Dingmans Ferry, PA - The Pocono Environmental Education Center (PEEC) has begun work on a new rain garden! The rain garden, located in front of the campus dining hall, is designed to beautify PEEC’s campus and to mitigate the effects of storm water runoff. The rain garden plants will help absorb the extra rain that collects naturally in this area. This rain garden project was made possible by a generous grant from the PSEG Services Corporation. PSEG’s Environmental Education Grant Program was developed in 1991 and has awarded grants for many environmental projects throughout PA and NJ. The rain garden project is a collaborative project involving many partners. The PA Department of Environmental Protection was the impetus for the project when their Growing Green Grant funded a campus wide system to naturally treat storm water and run-off. The National Park Foundation and the Lady Bird Johnson Wildflower Center provided seed funding and trained PEEC staff in the importance of native plants and rain gardens. A local Scout Reach troop from Middle Smithfield that has been learning about gardening and native plants will assist with the rain garden plantings. The next planting event will take place this summer. The rain garden will serve as a demonstration garden for all of PEEC’s annual visitors. Rain gardens are a wonderful way to protect our water resources. They help recharge the groundwater supply while keeping pollution out of our lakes, rivers and waterways. Rain gardens keep excess water in the area in which it belongs and provides a natural habitat for pollinators and other wildlife. The creation of this new rain garden will continue PEEC’s mission of advancing environmental education, sustainable living, and appreciation for nature through hands-on experience in a national park. PEEC provides unique, year-round environmental experiences to families, school groups, scouts, and nature enthusiasts of all ages. The environmental center is located near mile marker 8, within the Delaware Water Gap National Recreation Area, in Dingmans Ferry, PA (Lehman Township). For more information call (570) 828-2319 or visit PEEC on the web at www.peec.org. PEEC is close to home, where learning comes naturally! The Pocono Environmental Education Center (PEEC) will be offering a “Drum Making Workshop” the weekend of July 15-July 17, 2011 and a “Full Moon Drumming Workshop” on Saturday, August 13, 2011. Master Drummer, Maxwell Kofi Donkor will lead both of these exciting new programs. The “Drum Making Workshop” weekend will begin Friday, July 15 with registration between 3:00 & 6:00pm and will continue through Sunday afternoon, July 17. Donkor will lead participants through the steps of making their own drums, from selecting the natural materials and soaking the skins to heading the shells. Enjoy introductory drumming lessons, sunrise drumming, historical drumming culture, & more. No experience necessary. Registration is $325 and this amazing weekend includes 2 nights of lodging & 6 delicious meals. Master Drummer Donkor will return to PEEC in August for the “Full Moon Drumming Workshop”. This event will be held Saturday, August 13 from 7:00-10:00pm. Enjoy an introductory lesson and a drumming circle under the full moon. The peaceful evening teaches the basics of drumming and its rich cultural heritage. No experience necessary. Registration is $30 for adults & $15 for children, so call to reserve a drum! To register, call PEEC at 570-828-2319 with your information. Please visit www.peec.org/events-date for a complete list of all upcoming PEEC events and programs. Lehman Township, Dingmans Ferry, PA. The Pocono Environmental Education Center (PEEC) will be hosting its 10th Annual Golf Outing on Tuesday, July 19th at the historic Shawnee Inn & Golf Resort. Proceeds from the golf outing will benefit PEEC’s environmental education programs. Check-in and continental breakfast will be 8:30am. At 9:00am, a shotgun start will begin the scramble format golf outing. After a great morning of golf, participants will enjoy a lunch buffet at the Shawnee Inn. Winners will be announced & prizes will be awarded during the luncheon. To register, call PEEC at 570-828-2319 with your information. On-line registration is also available. Registration is $125 per golfer before July 15, 2011. On-site registration July 19 will be $140.00 per golfer. Please visit the PEEC Events Page for a complete list of all upcoming PEEC events and programs. Sponsorships for the golf outing are also available for individuals or businesses. There are 4 levels of sponsorship & all sponsors are invited to provide promotional items for distribution at the event. For further information regarding golf outing sponsorship, please contact PEEC at 570-828-2319 or at www.peec.org. PEEC’s mission is to advance environmental education, sustainable living, and appreciation for nature through hands-on experience in a national park. PEEC provides unique, year-round environmental experiences to families, school groups, scouts, and nature enthusiasts of all ages. PEEC is located near mile marker 8, within the Delaware Water Gap National Recreation Area, in Dingmans Ferry, PA (Lehman Township). For more information call (570) 828-2319 or visit PEEC on the web at www.peec.org. The Pocono Environmental Education Center (PEEC) has been working with a new group -the Teen Leaders Program, created through a generous community grant from Best Buy Children’s Foundation. This program provides an opportunity for youth to develop their leadership skills and give back to the community. The teen leaders have met several times this spring. At their recent meeting on Saturday, June 11, the participants discussed their community service projects, volunteered in the campus garden, and enjoyed a canoe paddle on Pickerel Pond. Many of the teen leaders have chosen to work on projects that will be displayed in PEEC’s EcoZone. The EcoZone is a new discovery room that has been built in PEEC’s old swimming pool area. 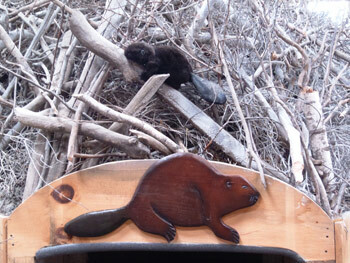 The room boasts a large cave and beaver lodge to explore, as well as a black bear skeleton, fossil pit, and much more. The teen leaders will work together to create a “pollinator” display that shows the specific flowers and plants to which different pollinators are attracted. A second display will focus on the dark, dirty world of decomposition and will showcase food items as they move through the stages of decay. Another project will involve the creation of a life size eagle’s nest. The Teen Leaders Program is designed to support the students and provide opportunities for their personal growth. At the meeting on Saturday, June 18, the teen leaders joined forces with PEEC’s summer camp staff to enjoy some team building opportunities. Everyone involved is having a wonderful time with this new program, which is made possible with the Best Buy grant. PEEC has enjoyed a positive relationship with Best Buy over the years. The Stroudsburg Best Buy employees have dedicated themselves to volunteering at a variety of PEEC programming and the Teen Leaders Program continues this successful partnership. The Pocono Environmental Education Center (PEEC) will be offering an “Introduction to Macro Photography” workshop on Saturday, July 9, 2011 from 9:00am to 4:00pm. John Jose, from Otter Creek Environmental Education Services, will lead this exciting new class. Macro photography captures the intimate details of the natural world. This is a beginner level class that teaches the basics of up-close photography. Anyone interested in macro photography is welcome. To register, call PEEC at 570-828-2319 with your information. Registration is $65 & lunch will also be available for purchase. Please visit www.peec.org/events-date for a complete list of all upcoming PEEC events and programs. PEEC’s mission is to advance environmental education, sustainable living, and appreciation for nature through hands-on experience in a national park. PEEC provides unique, year-round environmental experiences to families, school groups, scouts, and nature enthusiasts of all ages. The environmental center is located near mile marker 8, within the Delaware Water Gap National Recreation Area, in Dingmans Ferry, PA (Lehman Township). For more information call (570) 828-2319 or visit PEEC on the web at www.peec.org. Unplug Your Kids for a Week this Summer; We Promise it Won’t Hurt! “There is nothing to do.” “I’m BORED!” “Can I watch TV?” With the end of the school year fast approaching, these refrains are often used by children of all ages during the long days of summer vacation. The Pocono Environmental Education Center (PEEC) has the solution: Summer Day Camp. Summer Day Camp begins at PEEC on June 20 & continues through August 19, 2011 from 9:00am to 4:00pm Monday to Friday. Campers ages 3-11th grade will have up to 9 weeks to explore, play, and (shhhhh) learn about the natural world in which they live. Parents can choose individual weeks or register their children for the entire summer. Tadpoles (3-5 years) will have 5 weeks of camp available. Parents can choose from among such themes as “Fantastic Frogs”, “Bugs & Blooms”, or “Amazing Animals”. Tadpoles stay at PEEC for either half-day or whole day sessions. They will enjoy games, crafts, and outdoor discoveries. A PEEC instructor oversees a maximum of 12 children with the help of camp counselors & volunteers. The Wet & Slimies (1st - 4th grade) can choose from camp weeks such as “Fossil Frolic”, “Water World”, and “Creepy Crawlies” during 9 sessions. They will experience crafts, games, hikes, and nature discover sessions. They will be encouraged to explore the natural world around them, while being closely supervised by our experienced camp staff. Junior Naturalists (5th – 7th grade) will participate in creative activities that nurture their natural curiosity about the environment. Included will be the ever-popular “Camouflage!” week, as well as “Sticks, Stones, & Glue” and “Outdoor Living Skills”. During these 9 weeks, campers will participate in activities such as interpretive hikes, educational games, fun projects, and more. Junior Nats will also have a weekly late night and weeks 4 & 9 will include an overnight stay at PEEC’s tent sites. Senior Naturalists (8th – 11th grade) will have 5 weeks of activities. Themes will include “Ultimate Adventure”, “River Rendezvous”, and “Outdoor Survival Skills”. The Senior Nats will have weeks filled with exciting adventures & challenges, plus amazing trips at the end of each camp week. The “Backpack Explorer” week will even include a 3 day, 2 night backpacking trip. PEEC also has a Volunteer Counselor Program for teens ages 15 & up. Volunteer Counselors will learn the expectations of a real job while guiding children & changing lives. Please see the PEEC website for details or call 570-828-2319. Further information is available on-line at www.peec.org/day-camp, along with registration forms & on-line registration. For additional details or to have information mailed, call PEEC at 570-828-2319. Weekly registration fees range from $150 - $250 depending upon the camper’s age & the activities included in each week. Additional options available to parents, for an additional charge, are bagged lunches provided by PEEC & transportation from several area locations. PEEC’s mission is to advance environmental education, sustainable living, and appreciation for nature through hands-on experience in a national park. PEEC provides unique, year-round environmental experiences to families, school groups, scouts, and nature enthusiasts of all ages. The environmental center is located near mile marker 8, within the Delaware Water Gap National Recreation Area, in Dingmans Ferry, PA (Lehman Township). For more information call (570) 828-2319 or visit PEEC on the web at www.peec.org. Lehman Township, PA – Celebrate the opening of day of trout season with a great community event. The Pocono Environmental Education Center (PEEC) will be hosting its 2nd Annual Community Fish Fry on April 16, 2011. From 4-7 pm, family & friends can meet at PEEC for a fish fry dinner. After a delicious dinner, enjoy the spring evening with a short canoe paddle on Front Pond. During the day, while the fishermen & women are wading in the local streams searching for the first catch of the season, there is an additional program available at PEEC. Salamanders have begun stirring in the woods, so join the PEEC staff as they explore nearby breeding pools for salamander egg masses. This $5 event begins at 1:00pm on April 16. Nets & collection jars will be provided for up-close study. At the end of the day, fishermen, friends, & family can relax and enjoy the 2nd Annual Community Fish Fry. At $10 for adults and $5 for children 10 & under, it is a great way to end the evening. Fish will be provided and canoeing on PEEC’s Front Pond is included at no extra charge. The Pocono Environmental Education Center, a non-profit facility, is located within the Delaware Water Gap National Recreation Area, between Milford and Bushkill, PA. PEEC enhances environmental awareness, knowledge, and appreciation through hands-on experiences in an outdoor classroom. PEEC is close to home, where learning comes naturally! Lehman Township, PA - The Pocono Environmental Education Center (PEEC) in Dingmans Ferry, PA will host its 16th Annual Earth Day Family Festival on Saturday, April 23th, 2011 from 10:00 am – 4:00 pm. This year’s theme is “Leave Only Footprints” & it’s a great event where you and your family can celebrate Earth Day this year. Families can enjoy and participate in any of the day’s many activities. A great variety of activities, crafts, and projects will be available along with guided nature hikes and recycled crafts -- including making jewelry out of our local Pocono Sea Glass. Home Depot will be here providing materials and assistance in making bird houses to take home. The festival will include family-oriented hands-on learning stations, sustainable living ideas, and environmentally-friendly products, businesses, and much more. There will be Live Music bylocal area musicians Ken Galipeau & Rick Nichols; and Bob Dorough, creator of “School House Rock”. Back by popular demand is our tie-dying station! Bring cotton shirts, socks, pillowcases, and other items to be tie-dyed with your very own colorful design. PEEC Earth Day t-shirts will also be available for purchase. Featured events during the day-long celebration include documentary video by The Delaware Valley Eagle Alliance and a live animal presentation by The Pocono Snake and Animal Farm. Kittatinny Canoes from Dingmans Ferry, PA will be available to introduce families to canoeing and kayaking on PEEC’s ponds. Also, plan for summer at Earth Day! Register your child for PEEC’s Summer Day Camp and receive an Early Bird Rate. If you sign up at Earth Day, you will receive a $5 per week per child discount on summer camp. The Pocono Environmental Education Center, a non-profit facility, is located within the Delaware Water Gap National Recreation Area, between Milford and Bushkill, PA. PEEC enhances environmental awareness, knowledge, and appreciation through hands-on experiences in an outdoor classroom. The Pocono Environmental Education Center (PEEC) is pleased to announce a new, exciting program for 2011! The Teen Leaders Program, created through a generous community grant from Best Buy Children’s Foundation, provides an opportunity for youth to develop their leadership skills and give back to the community. The teen leaders will meet throughout the year to work on community service projects, recreational activities, and important life skills. The first meeting was Saturday, April 2, on the PEEC campus. The students, ranging from 5th-11th grade, had a chance to meet each other and participate in some fun team building activities. Cooperation, communication, problem solving, and trust are important components of PEEC’s Teen Leaders program. The year ahead will provide many opportunities for the students to work together towards success –from canoeing and rock climbing to public speaking and community service. The teen leaders also began working on their individual and group projects for PEEC’s Earth Day Festival which will be held on Saturday, April 23, 2011. There are some creative projects taking shape, including displays on decomposition, local wildlife, pollution, worms, plants, and other subjects that are near and dear to the hearts of PEEC’s teen leaders. The Teen Leaders Program is designed to support the students and provide opportunities for their personal growth. PEEC is looking forward to all of the upcoming meetings and events with the teen leaders. In addition to the Earth Day Festival, the teen leaders will be involved with the planning of PEEC’s Harvest Festival on September 10, and the annual Halloween celebration, PEEC-a-BOO, on October 29. Everyone involved is excited to be starting this wonderful new program. PEEC has enjoyed a positive relationship with Best Buy over the years. The Stroudsburg Best Buy employees have dedicated themselves to volunteering at a variety of PEEC programming and the Teen Leaders Program continues this successful partnership.